When life gives me lemons, I have my wife make me a glass of lemonade. Extra ice. And then I put my feet up and hope that life gives me the ingredients for a sandwich as well. You could say that I am a very lazy optimist. So, when the Zillionaire Homestead became infested with bees, I didn’t panic. I didn’t even blink. I merely dusted off the juicer and readied a clean glass, metaphorically speaking. The bees’ days were officially numbered. The only question was how best to eliminate them. I considered using various poisons, but since I have a baby at home, and friends (Krusty, I’m looking at you) that will indiscriminately eat things off the floor, I thought better of it. I pondered digging miniature tiger pits all over the yard. I looked into flypaper. Ultimately, I had no desire to kill these bees in the most unsanitary way possible. Finally, I began to use my brain. What animal eats bees? They must have a natural predator. I bought an anteater, thinking it would be close enough. It didn’t work out. I could train them to fight each other to the death for the amusement of others. This seems like it could be the perfect undercard event to a cockfighting match. Maybe I can get a vapid quasi-celebrity to walk around with a well-groomed bee in her handbag. And voila, the bee would instantly replace the Chihuahua as a fashion accessory. I could single out the biggest specimen and take it to a taxidermist. But instead of having it stuffed, I’ll have it made into a rug. I could sell them as pets. Aren’t people sick of having pets that can’t fly and have fewer than six legs? I know I am. Maybe someone could use them as part of an amateur audition tape for Fear Factor. Seems like a worthy cause. Hell, I’ll even throw in some rotten dairy products as well. With this many agitated bees, it seems like I should be able to take the concept of a flea circus up a notch. Candy is so played-out on Halloween. What kid wouldn’t like a handful of bees? Maybe this could be a roadside attraction? I could charge travelers from the Midwest a dollar to let them take their kids’ picture next to the infamous bee trap. Naturally, using the bathroom would cost an extra dollar. Finally, if you have a better idea, I’m willing to sell these bees directly to the general public. Simply send me a self-addressed stamped envelope and 25 dollars per bee for “handling” charges. Be sure to mark “FRAGILE” on the envelope though. And poke some holes in it too. Would it be possible to take a humanitarian look at this problem? Maybe you should donate them to charity, then take the tax break. It’s a win-win situation. What about making a bee speedo? That should impress some ladies. Or a ham and bee sandwich? A beecicle? Seems to have a nice ring to it. I’m available for tips on insect training any time. Trained bees could be quite a force! Perhaps the military could be interested and work it into their budget (I’d be game). Imagine solving our killer bee problem by training them to seek out terrorists and leave the country. Your heroic bees would reach even those who have been unreachable by our best forces in the past, and provide good PR in the form of honey for those who deserve it at the same time. Let me know if my fleas can be any help as well at flea-circus.com ! Apparently, you really like lemonade and kids are dumb enough to sell it. There’s a market here, folks. Stroll up to the nearest lemonade stand and test your pitch. Explain that each bee is hand-picked from another country but only a few are top contenders (OK, we sedate the bees and paint them in order to distinguish who’s who, but whatever). Kids pick a bee for $1 each and if their bee wins, they get everyone else’s “bee fee.” Gambling at its finest. Before doing so, you gotta sell ’em on the events. A few come to mind– Swarm the Melon, the Pollen Vault, Spider Polo, Freestyle Sting. It will be all the rage in the ‘hood. Now GO! Dammit Walt Noon, we need to combine forces here. Give them all contracts, endorsements, whatever… just train them man, train them!!! Walt, if it is a game of oneupsmanship you are seeking I’ll have you know that I am already conceding defeat. Yep, I fold that easy. I have to hand it to Walt, that’s some crazy stuff he’s got going on there. Hey, if you feel jelouse just send the bees down to his circus and have’em wreck up the place, you know, show them who’s boss. As the only one of us that actually knows anything about nature I feel obliged to point out the fact that what you have in that trap is a yellow jacket. 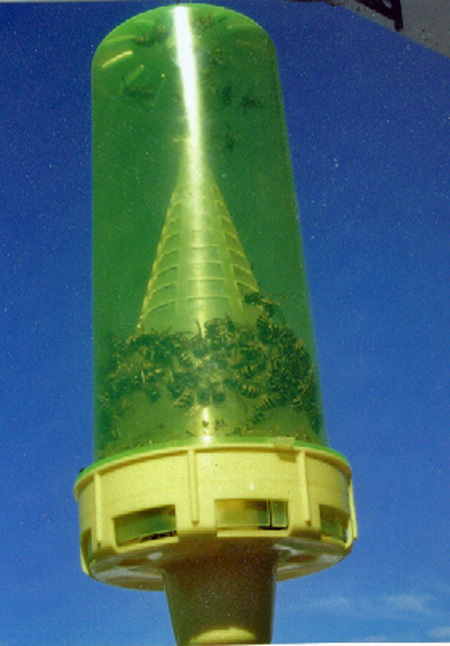 Those traps are specifically designed to catch yellowjackets. These little bastards are non polleninating carnivores. They are slightly lawyers as the biggest waste of space on the planet. So in conclusion kill away kill away. 2. put a bee in it. I have the perfect trick. They will sell like hot cakes. Although I don’t really remember the day when hot cakes “sold really well”. OK, so all you need is a jar, stick, & 2 feet of fishing line. Do you know where I am heading with this? OK, then keep reading. Capture the bee in the jar and put it in the freezer for about 5 minutes. This will stun the bee unconcious. Take it out of the freezer and tie the string to the stick. Tie the other end of the string to the unconcious bee around it’s torso but be careful not to block its wings. Wait a minute for the bee to wake up and immediately be rageful. then you have bee on stick. Oh ya, one last pointer. Make sure the string is not as long as the stick or else he will sting you.